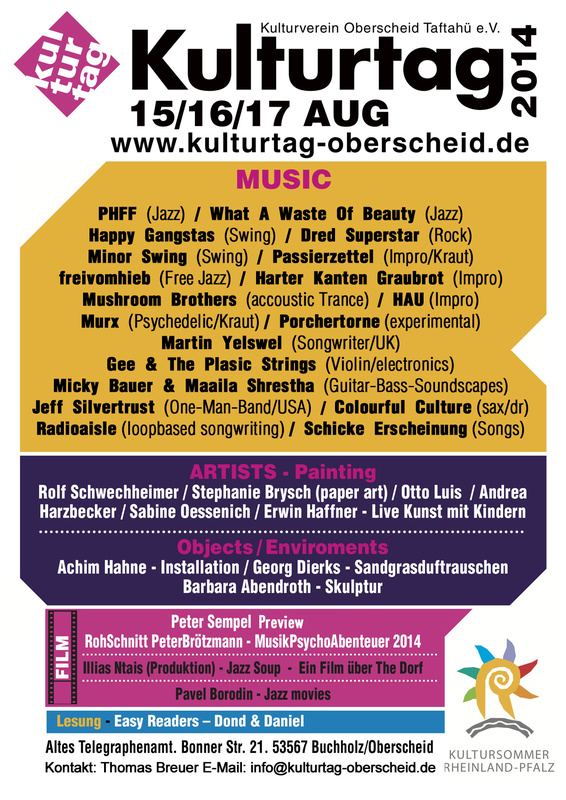 3 days – from 7th to 9th August 2015 – artists and musicians will gather again in Oberscheid. The line-up is finally wrapped up. To our great amazement we had many requests from all over Europe! Update (04/15/15): Schicke Erscheinung from Dortmund will be playing in Oberscheid. Two men over 50 with accoustic guitars who get on quite spiffing together and still know how to make some noise if needed. We also like to thank the Kultursommer Rheinland Pfalz, who with his friendliy support made it possible that the Kulturtag will become again an unforgettable event. 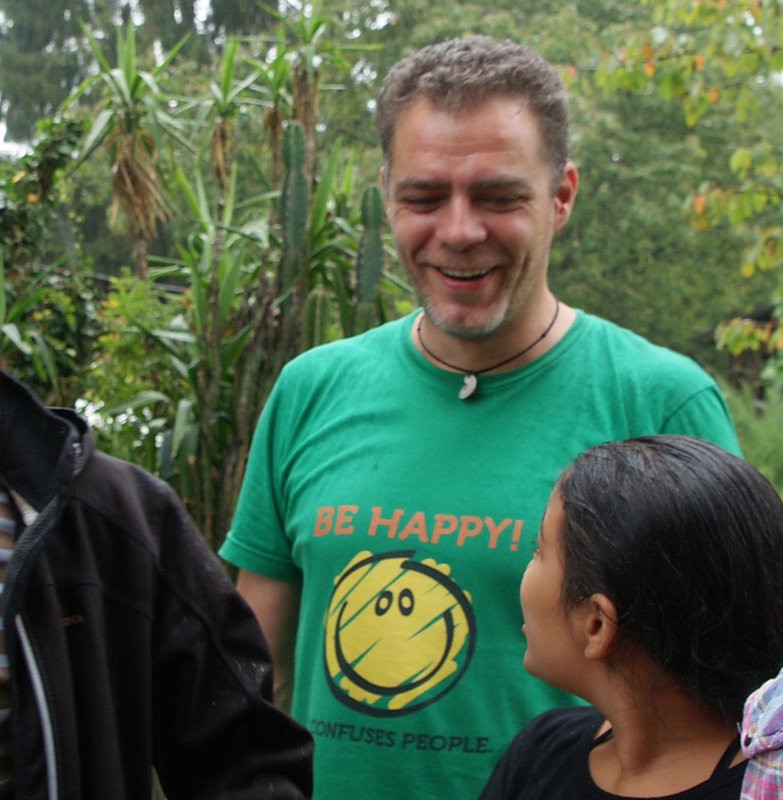 We are sad to announce that our friend and club member Axel Schäfer passed away unexpectedly on 25. September. Axel is survived by his wife and his four children. We like to meet at Rolf’s house shortly to say good-bye. The exact date will be announced soon. Dear Guests, artists, musicians, friends, helpers and supporters! A big thank you to you all! 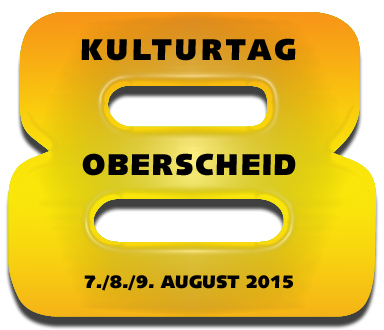 2014 was the biggest and best visited Kulturtag ever! Despite the nastiest weather conditions! tons of fotos and videos. Your comments will be appreciated! 7. – 9. August 2015 – See you at Kulturtag 8! If you were already curious who plays/performs/shows movies where and when – the agenda for Fryday, Saturday and Sunday is finally available and can be found in the submenu of Program 2014! We have to admit that we’re quite late with the agenda this year – however it was a very challenging procedure since the Kulturtag presents more artists and musicians than ever. And of course there were these last minute changes – not really a surprise! Therefore we like to point to the brandnew info about Pavel Borodin‘s musicmovies: He picked out some very exciting material especcially for the Kulturtag – more info can be found of course at Program 2014. We love to present new artists at the Kulturtag and we’re always giving our best to provide an optimal presentation. But Rolf Schwechheimer, the man who makes all this possible sometimes does not get the attention he deserves. Rolf created phantastic new paintings, made wooden sculptures, prepared an exciting performance and he arranged his “Island” in Oberscheid even more fanciful than it already was. 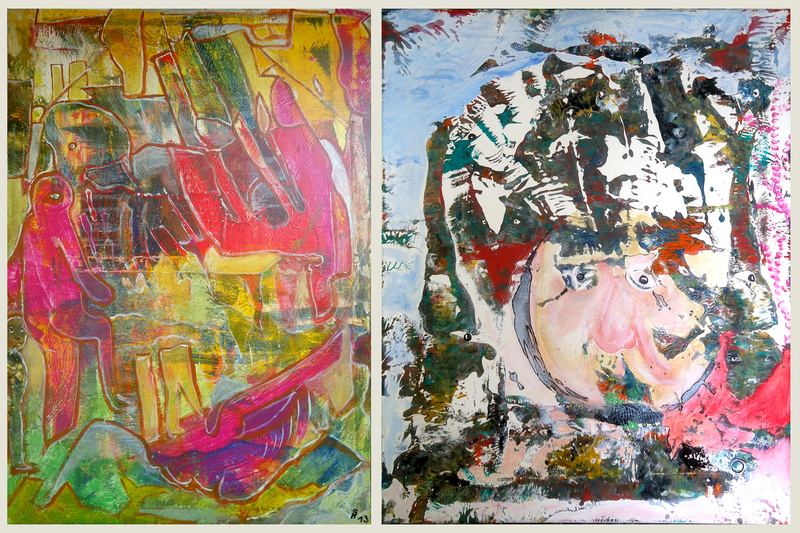 Therefore I like to spotlight Rolf´s work. And: most of his works are for sale. Since he’s a lovable but shy person, Rolf never promotes his work and avoids business talk – so, don’t be shy yourself and contact him if you’re interested. Press attention assured: half-page (!) 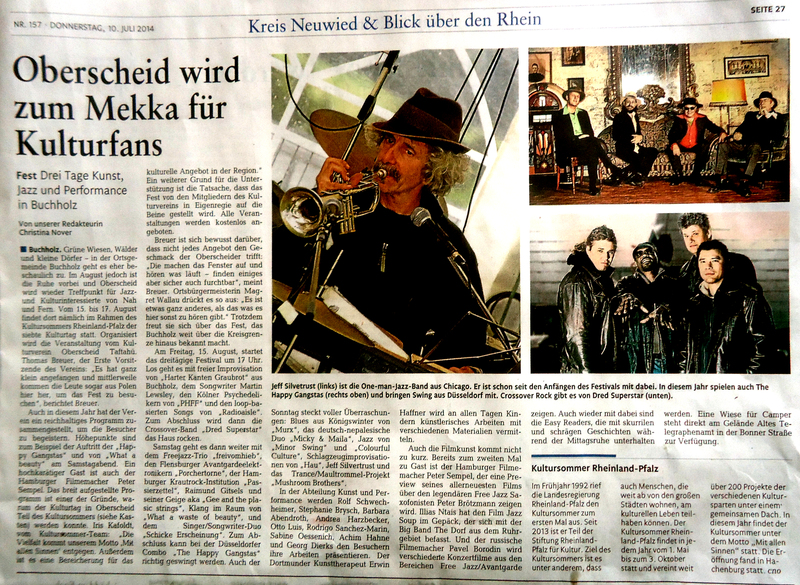 article in the Rheinzeitung. Rodrigo Sanchez-Marin has been busy since last years Kulturtag and will bring us new Alebrijes. 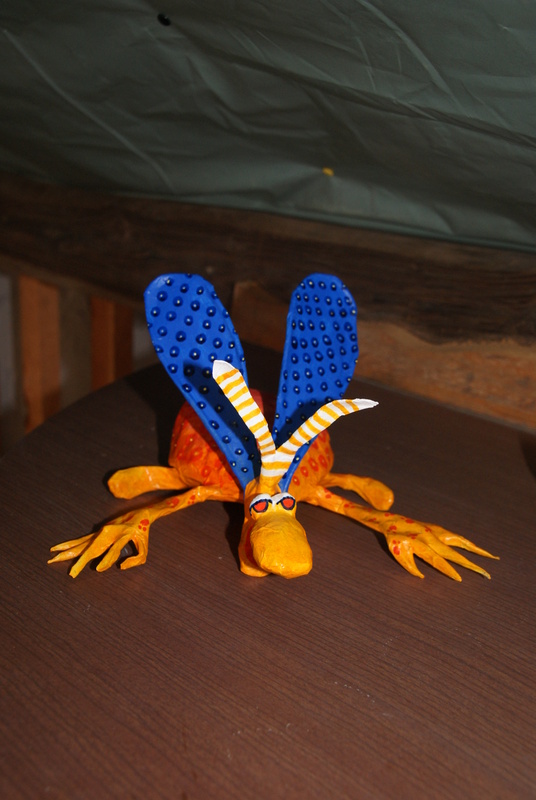 If you do not know what Alebrijes are: These are traditional mexican fantasy figurines made of papier mâché. Unfortunately André D. and Christophe Meulien of Les avantages d’une haie de tròenes had to cancel their trip to Oberscheid. Fortunately all artists and musicians are mega flexible, therefore Henner Gräf and Frank Wilke called Uwe Juchum and the trio will present us again the finest Free Jazz with freivomhieb. Micky Bauer and Maaila Shrestha decided spontaneously to collaborate so we’ll not only listening to guitar soundscapes but guitar/bass soundscapes – wow! Rolf Hillebrand, drummer of Murx had to cancel his appearence, but since flexibility (see above) is part of Oberscheid artist’s job description, Georg Dierks (Colourful Culture / Mushroom Brothers) will pick up the slack – thanks Georg!